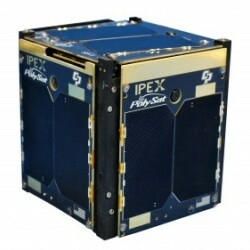 IPEX is a 1U (10 x 10 x 10 cm) cubesat, funded by NASA’s Earth Science Technology Office (ESTO), designed to validate onboard instrument processing and autonomous payload operations for the proposed NASA HYperSPectral Infra-Red Instrument (HyspIRI) mission. IPEX carries several low-resolution (3 mega pixels) Omnivision OV3642 cameras as a stand in for actual science instruments on future NASA missions. These cameras are capable of acquiring many images (several per minute) over the mission lifetime providing data to validate onboard processing. Active. CP-8 IPEX was launched into Low Earth Orbit on an Atlas V rocket from Vandenberg Air Force Base in December 5th 2013. After attaining orbit, the IPEX spacecraft self stabilized using passive magnets mounted in the IPEX structure. After stabilization, IPEX is commanded from the earth station at Cal Poly San Luis Obispo. Active, received and decoded.